Kerry is to get a new tourist attraction, with confirmation of half a million euro in funding for a looped walk along the shores of the Lakes of Killarney. The Department of Rural and Community Affairs will help fund the 9km trail through woodlands on the slopes of the 735m Tomies mountain, the shores of Lough Lein and O’Sullivan’s Cascade in Killarney National Park. 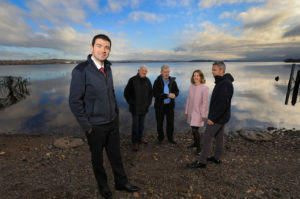 Junior Minister Brendan Griffin with Michael Spillane, Fossa Way, Padruig O’Sullivan, National Parks and Wildlife Service, Niamh O’Shea, President Kerry Branch Irish Hotels Federation, and Paul O’Neill, President of Killarney Chamber of Tourism and Commerce. A further €208,000 has been approved for a major upgrade of the Dingle Way. Junior Tourism Minister Brendan Griffin said: “It is crucial that we invest in such world-class locations to ensure that they can facilitate visitors sustainably so that everyone can enjoy the experience when they go there”.